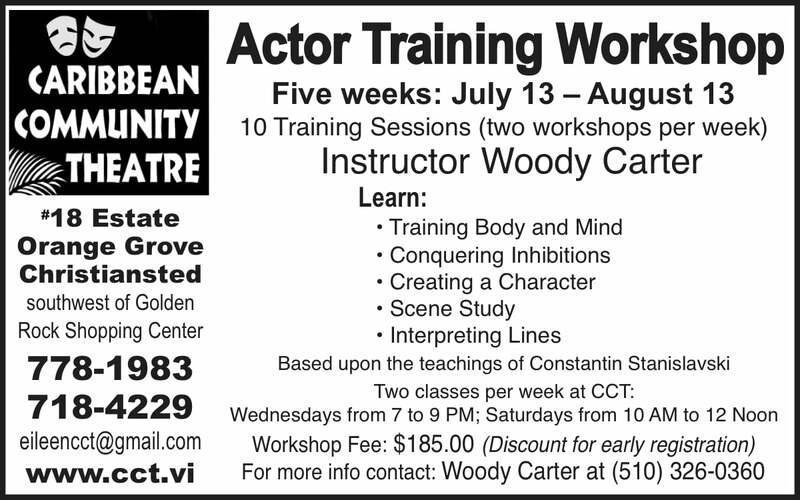 The Caribbean Community Theatre is sponsoring a Five Week Actor Training Workshop beginning on Wednesday, July 13, 2016 for a total of 10 training sessions (two workshops per week). The class will meet on Wednesday evenings from 7:00 pm to 9:00 pm, and also on Saturday mornings from 10:00 am to 12:00 noon for five consecutive weeks. 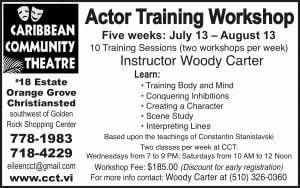 Woody Carter holds a Master’s degree in theater arts from City University of New York, in NYC. He began his theater career at the African-American Studio for Acting and Speech, in New York City, in 1972 where after training as an actor was invited to teach acting technique, scene study, and rehearsal and production. He has also taught actor training and rehearsal and production at Laney College and Contra Costa Community College in the San Francisco Bay Area. He also held the position of artist-in-residence for the National Radio Drama Project, sponsored by the National Drama Association of Trinidad and Tobago (1981); artist-in-residence for Community Theater Development, Virgin Island Council on the Arts, St. Croix and St. Thomas (1973), and theater instructor for Woodlawn High School, Hartsdale, NY (1971). He has directed well over 15 productions and concert events, including James Baldwin’s The Amen Corner; Derek Walcott’s Dream on Monkey Mountain; El Hajj Malik: The Dramatic Life and Death of Malcolm X, by N.R. Davidson, to name a few and plays by Ted Shine, Imamu Baraka and others. He also produced the National Dance Company of Trinidad and Tobago Concert Series (1983), University of California, Berkeley. Registration: $50.00 non-refundable deposit due with completed registration form and if paid by check paid to: “Caribbean Community Theatre”. 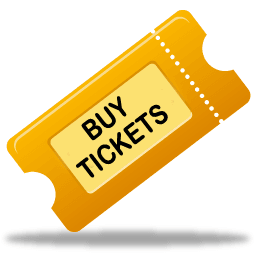 Balance of $135.00 due at first workshop session, Wed., July 13, 2016. $15 discount ($170.00) if fee is paid in full before beginning of first session. For additional information contact: Woody Carter at (510) 326-0360.